The National University of Kyiv-Mohyla Academy received a digital copy of the historical declassified documents of the Soviet era (1918 to 1991) from the Archives of the Security Service of Ukraine (SSU  СБУ) at a presentation ceremony which took place on March 18. The transfer of previously secret NKVD-KGB (People's Commissariat for Internal Affairs- Committee for State Security) files is regarded as a remarkable event and illustrates the need for transparency and the search for a shared historical narrative. The official ceremony took place at the National University of Kyiv-Mohyla Academy, with the participation of Volodymyr Vjatrovych  former Director of the Archive of the Security Service of Ukraine (SSU), Serhiy Kvit  President of the National University of Kyiv-Mohyla Academy, Tetiana Yaroshenko  Director of Kyiv-Mohyla Library, renown academics Volodymyr Panchenko and Roman Mycyk, and many researchers, faculty members and members of the media. Access to secret archives of the Soviet era was closed in Ukraine until recently, when the Security Service of Ukraine declassified and opened previously closed files. For years historians demanded access to the archives for insights into the nature and events which transpired under Soviet rule. In October 2008, archives on Soviet activities in Ukraine have been opened for examination and study at the archival facilities the Security Service of Ukraine. Tens of thousands of formerly closed files became accessible at the location of the information-research rooms in Ukraine's Oblast (province) SSU Centers. The "Regional State Archive SSU", published in Kharkiv in 2009 ("Prava Liudyny" PH), was the first to reveal the structure and content of the archives of Soviet special secret services. There are over seventeen thousand documents which were transferred to Kyiv-Mohyla Academy in electronic files categorized by topics such as the Holodomor 1932-33, OUN-UPA (Organization of Ukrainian Nationalists), Political Repressions in Ukraine, Liquidation of Jewish Organizations, Deportation of Crimean Tatars, the Dissident Movement and other subject areas. All speakers at the presentation agreed that the documents need to be accessible to researchers, historians and families of those individuals who disappeared during the Soviet era. Historical, ethical and moral reasons require that the information must be studied and opened. In the last few weeks, since the change of leadership in the SSU, digitization of archival materials has stopped. The president of the National University of Kyiv-Mohyla Academy, Serhiy Kvit, stated that "access to historical archives is an essential requirement of a participatory democracy and the closure of archives is a step-backward in a free society." Former Director of the SSU Archives Volodymyr Vjatrovych said that "the SSU should not be the guardian of state secrets of the USSR  a non-existing country-, the SSU should not hide the secrets of a totalitarian regime which committed crimes against the Ukrainian nation. If the current leadership of the SSU will take such a position, it could be interpreted as a cover-up of the crimes of the Soviet totalitarian system". Since the fall of the Soviet Union, the KGB archives have often been at the center of controversy. The presentation of these electronic records is a historical milestone and a significant step toward shared investigation of primary materials for understanding the history of the twentieth century. The transfer of the digitized archival materials is unparalleled. It will provide access to these important historical documents to researchers, faculty and students for the search of historical facts. Commenting on remarks by Valeriy Khoroshkovskyi, the recently appointed Head of the SSU, about the necessity to stop the work on archival materials, Volodymyr Vjatrovych stated: "The country cannot hide the secrets of totalitarian regimes and cover-up crimes against humanity. The study of history requires access to archives. Open access to information is the basis of democracy". The electronic copy of the previously closed KGB archival documents will be accessible at the Kyiv-Mohyla Academy Library and through the Kyiv-Mohyla website  www.ukma.kiev.ua. 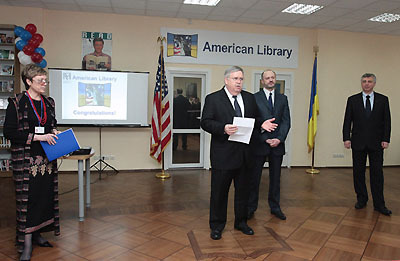 Tetiana Yaroshenko, Director of the Kyiv Mohyla Library stated that "the documents are of great importance not only for the research and study of the past, but for understanding Ukraine's current post-totalitarian, post-genocide society which is in the process of building a democratic state".